This massive assortments features a collection of incredible items for a complete show! You get a variety of reloadable shells, including canisters, double breaks, and triple breaks. You also get a lineup of Boomer 16-shot 200-gram repeaters, along with a half-dozen of our favorite 500-gram repeaters. 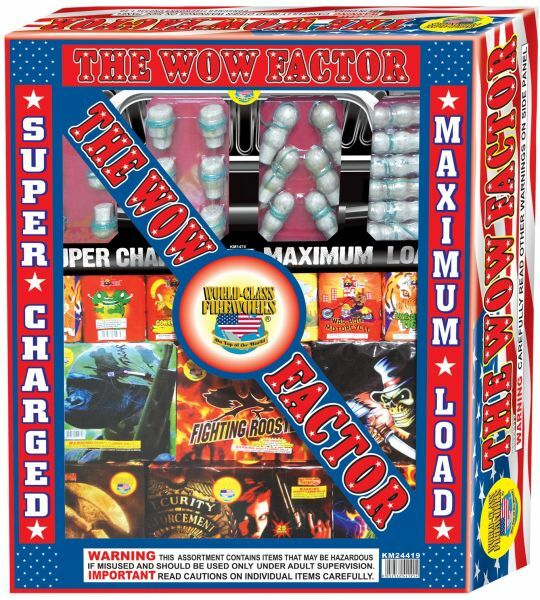 A large assortment from Brothers with a variety of items incluidng 3 artillery shell kits, 3 packs roman candles, 1 pack helicopters, 1 pack ground spinners, 10 fountains, 1 pack crackers, 5 200-gram repeaters and 5 Brothers Heavy Weights 500-gram repeaters. This is the biggest assortment in the Brothers product line, featuring 782 shots and 8000 grams of powder! It contains a mix of canister shells, 200-gram repeaters and 500-gram repeaters. Four of the 500-gram repeaters are the popular Brothers Heavy Weights "Da Big Box O' Bombs" set.